I know it's weird, but while I don't particularly like visiting the cemeteries (like Arlington or Normandy), I really love seeing the monuments and memorials. I love them for the history, the concepts and the values that they teach us. There's just something amazing how we choose to honor our fallen. Even more amazing, is the amount of thinking and controversy that goes into the symbolism of the design and quoted materials, the raw materials they use, the placement of each piece and the location itself. 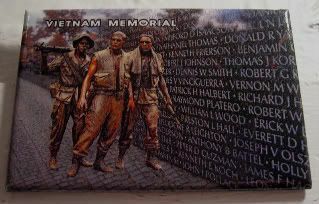 Take, for example, the Vietnam Memorial which not only includes the Wall designed by Maya Lin, but also encompasses the Three Soldiers statue designed by Frederic Hart and the Vietnam Women's Memorial by Glenna Goodacre. You can read much of the Wall description in Maya Lin's own words, but the short of it is, the design of the Wall is meant to show an open rift in the earth - loss - with one wall pointing toward the Washington Monument, the other pointing toward the Lincoln Memorial, supposedly to show Vietnam in historical context. Her intent was that as you descend into the apex of the wall, the rest of the world disappears, and as you reach that point where the two walls meet, you're in a quiet, private place surrounded by 58,260 names, the overwhelming number of fallen engraved into the granite. That granite, where even as of last year, they are still adding names to the list, for all manner of reasons. But, then, as you leave that quiet place and walk up the other side, you slowly rejoin the world, presumably with more knowledge and maybe even a tiny bit of hope. The site itself is just powerful, and quite awe-inspiring. So when I was there, it was hard for me to believe that back in the day, so many constituents were opposed to the design, opposed to the placement, and even opposed to Lin. And, honestly, I've heard that story before, when it comes to these monuments. Of course, when you have that many people to please - veterans, the public, and government - it's nearly impossible to make everyone happy. But what strikes me most about any type of memorial of this kind, is the feeling that people seem to get when they visit - what Lin calls universal loss. It tends to spawn that innate sense of hushed and honored silence. And there's something comforting knowing that at whatever memorial you are in the world, there's someone at another memorial for another war, for another set of heroes, feeling the same thing you are.